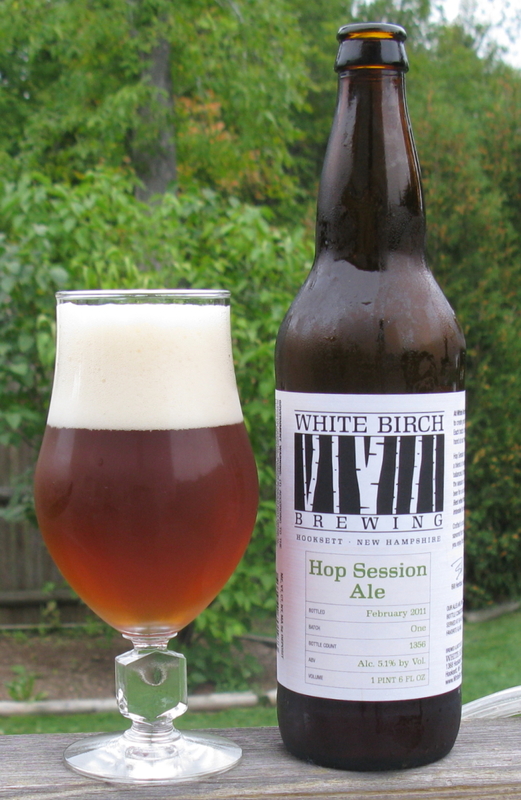 Well, after mowing the lawn on the surprisingly warm first day of autumn, I decided to open a bottle from White Birch Brewing I had not had before, Hop Session Ale. The description on the bottle says “Starting with a blend of west coast hops for a balanced, bitter effect. We close the session out by dry hopping the beer for a nice, resiny, mouth feel. Best when fresh, this beer is not intended for cellaring.” Well, this bottle was dated February 2011, so I maybe a bit late, but I thought better now then never. Tasting: 22 oz bottle, Batch One, Bottle 1356, 5.1% ABV. The beer pours a nice, fairly clear, amber/red color. The nose is piney hops, with some citrus, classic American hops aroma. There is also some fruitiness to the beer, hard to tell if it is yeast or the hops, but you can get some apple and melon, and them some darker fruits like plum on the back. There is also a toasty note to the beer. On the taste, you get the hops right away, again, the pine flavor is the strongest, but there is a nice caramel background and toasty taste to it, before it fades into a very nice bitter end. Critique: Ok, this is a pretty darn good American Amber. More malt and toast, and a bit more mouth feel then your typical American Pale, and at 5%, a bottle of this is not going to end your night early. My bottle is several months old, so I suspect some of the hop brightness is gone, but still the dominant flavor. I am very impressed with the malt backbone, and the balance with the hops. Best beer I have tried from White Birch. It is a very drinkable, very solid brew. Now I gotta try a fresh bottle to see what the hops are like when the beer is still very young.